Boethius: "It's my belief that history is a wheel. Inconsistency is my very essence" -says the wheel- Rise up on my spokes if you like, but don't complain when you are cast back down into the depths. Good times pass away, but then so do the bad. Mutability is our tragedy, but it is also our hope. The worst of times, like the best, are always passing away" Speculation circulates much akin to the nature of the wheel rising and falling, eventually feeling redundant, but today signs are emerging that may reveal the recent confirmation of Joseph Gordon Levitt's role in Christopher Nolan's Batman: The Dark Knight Rises which was initially believed by many to be "Alberto Falcone." Not anymore, but "The Black Mask." Hit the jump for the details. The reasoning comes via the fact that BatmanonFilm who were privy to "Bane" being involved speculated that Levitt would either play Falcone or The Black Mask, not only this but since the Falcone role was later de-bunked. BatmanonFilm removed all references to Levitt as being linked to The Black Mask, replacing the Villain's name with "Xxxxx XXxx" before later changing it back again because yes people have memories. This may appear trivial but we know the site has a privileged relationship with Warner Bros they may well be they are protecting that. Batman-News spotted the changes and CBM spotted protecting that. 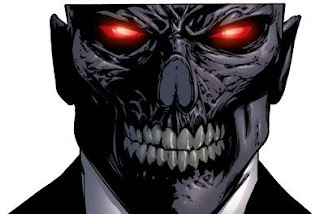 On another note its maybe worth mentioning that The Black Mask was one of the main Villains [along with Catwoman] in a supposed leaked Batman: TDKR script which was forwarded to us. I'm reading: SERIOUS SIGNS THAT "THE BLACK MASK" IS THE SECOND VILLAIN IN [BATMAN: TDKR]Tweet this!